These are the words of Rachel, of Eugene, OR. When I was 9 years old I was diagnosed with cancer, a leukemia called meyeloidysplastic syndrome or MDS, which is a pre-form of AML (Acute Myelogenous Leukemia, normally found in adults). At the time the only medical cure was a Bone Marrow Transplant. I lived all of 4th grade and half of 5th grade very anemic. At first the doctors tested my brother and he was a match, but when they re-tested him, they found that he was not a match. A match as in a bone marrow donor. After an unrelated donor was found, I went to Seattle WA at Fred Hutchinson Cancer Research Center to have the bone marrow transplant. (My donor's name is Bonnie) I went into the transplant with a 40% survival and 60% fatality rate. My transplant date is January 27, 1993. This became my second birthday. I was in the hospital for the transplant about 31 days. Most of that time I spent being in a 'bubble', to try and keep where I was sterile so that I would not get an infection because I was SO immunosuppressed. I took a large dose of Chemotherapy to kill all of the fastest growing cells in my body, including the cancer. After the transplant I stayed in an apartment near the hospital (Swedish memorial) with my mother and 6 year old brother. My father visited on the weekends because he still had to work during the week in Corvallis, OR. I stayed up in Seattle for about 6 months after the transplant because I had every side effect and complication in the book. Throughout that time I was in and out of the hospital and saw doctors and did tests every day. It was a very hard and painful time for me physically, spiritually, and psychologically. Throughout the whole experience I knew that it would get better eventually. I did not know why I went through what I did, but I just kept faith in God that He would help me and take care of me. As a result of the large doses of prednisone or steroids I was taking, I could no longer walk. After we left Seattle and went back to Eugene, Oregon, things started looking better. 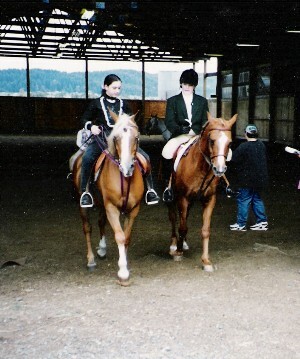 We left Seattle in late July 1993. 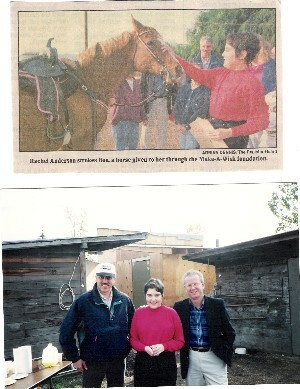 I received a horse through the make-a-wish foundation, which I am very grateful for even to this day. 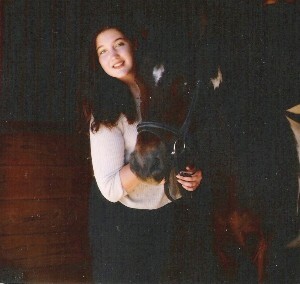 I was given my horse 'bu' around October 1993. In November 1993 I started having severe stomach pain. As a result of the transplant and all of the graft-versus-host disease (my body rejecting new organ, in this case the new bone marrow, GVH can be fatal, people who have a heart, lung, liver, kidney transplant have to be on immunosupressants the rest of their life so that their body doesn't reject the different organ) I developed a high tolerance to pain. Instead of telling my mother sooner about the pain, I just dealt with it because i was so used to feeling pain. Later on though the pain got SO bad that I did tell my mother. I went to the doctor and all my labs were off. At this time I am in Eugene, OR. In November, I was admitted into the hospital at Sacred Heart Medical Center (where I have now worked for 4 years). This can kind of get confusing so please bear with me. I had severe GVH (graft vs host disease) with my kidneys. As a result of GVH my kidneys threw a blood clot to my brain and as a result I had 5 strokes and a grand-mall seizure. After this the doctors did a brain biopsy (I still have the scar) because they thought I might have an infection in my brain. Thankfully I did not. However shortly after my blood pressure started to drop fast as I was going into sepsis or septic shock, I was rushed to the intensive care unit and then rushed into emergency surgery. As it turned out I had gall-stones, that leaked infected material into my whole GI tract. The doctor even had to take out all of my intestines and he looked for perforations (holes) and cleaned off the infectious material from my gall bladder. He also took out the gall bladder. (so i have a big scar from that too) After surgery my kidneys shut down and went into kidney failure. While I was in ICU I was on dialysis. I was also in a coma and was non responsive because I was sooo sick. I was also intubated on a respirator because I could not breathe on my own, and I got tube feeding through my nose. While all of this was happening, I had no immune system what-so-ever because I just had a bone marrow transplant that wiped it out, plus I was on immunosupressants to help fight off GVHD and other reasons I don't remember. This was right before Christmas 1993. The doctors said I had 0% chance for survival. While I was in a coma I could hear things, but could not open my eyes or move. I knew that it was not the end though. I did not know what was going to happen but I knew I was not going to die. 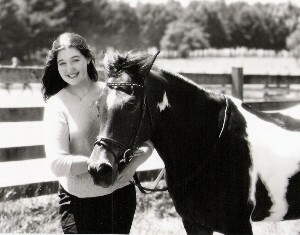 I had loved horses all my life and I had this internal drive and strong will to survive this so that I could see my new horse and that God was taking care of me. On Christmas Day, Christ healed me, miraculously my kidneys started working and I was finally able to breathe on my own. I have never doubted that God healed me that day, Christmas Day 1993. I was in ICU for 2 weeks and in the hospital for a total of 5 weeks. I was discharged in the beginning of January. Again, I could not walk. It took me about a year after that to start to feel somewhat like I was on the road to getting back to normal. 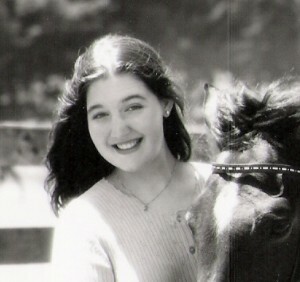 I used horse riding as my physical therapy to regain my strength. Praise be to God ! and rejoice because I am still here!